Learning How to Code: Relearning How to Learn – Report #1 – Media! Tech! Parenting! Now those of you readers who are educators and parents know that kids often take care of things like this by figuring out things for themselves — and my students did just that, experimenting and trying things out — but I wondered, “If these questions were coming up on the second day, what would the second week be like?” I needed to master some new Scratch skills and fast. 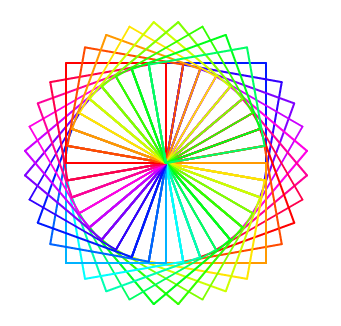 My color wheel programmed with squares. But how? Did I mention that I have never coded before (excepts for those odious punch cards way back when), and I have not taken a math course since my first year in college? My answer came in the form of a unique connected learning online course, taught by Steve Bergen, who runs face-to-face Summercore/iCore workshops all over the country. Steve also teaches online classes, and a Scratch class just happened to be scheduled for this fall. So I signed up for one lesson a week to work on independently, one half-hour of one-on-one telephone or Google Hangout coaching each week, and his expectation that we do least two hours of homework working on projects per week. Oh, and if I need extra help, Steve welcomes emails, and he offers to schedule extra sessions. Now in week three of the eight-week course, I am definitely out of my comfort zone because Scratch is hard work, despite the fact that the little cartoon cat (or dog or bat or horse or bird) smiles ingratiatingly at me. 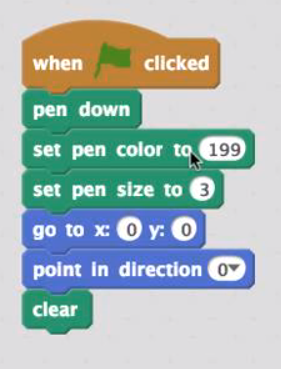 This programming is filled are all sorts of artistic bells and whistles — all based on a fair number of mathematical ideas (get ready to review geometry for starts). So far I am clocking in the five to six-hour range — and it’s the first month of school, so I really don’t have that much extra time. Yet I have to admit, it’s fun, and it’s keeping me a teensy-tiny distance ahead of my students. My starter commands, though I can set the color to anything I want. I now know (again) what a variable is and last week we explored random numbers (a heads and tails flipping the coin game). I have not looked at the third lesson (due out today), but have no doubt that Steve will be teaching us something else that will make me struggle. What I do know is that each time I feel way out of my comfort zone, I get frustrated and wonder why on earth I signed up for the course. Then I double down, experiment, occasionally go into the Scratch website to see what others (others = mostly kids) have done. I struggle some more, and all of a sudden, I figure something out. My brain is not quite at the stage where it thinks as a coder, but I am getting better and understanding the need for careful step-by-step sequential commands. Twentieth-first Century learning at it’s best? Yesterday I was struggling so much with a project that I finally emailed Steve to ask for an extra work session on Monday night. Then, within a couple of hours of my request, I figure things out! But that’s not a problem. In my enthusiasm I started another problem … which I have no idea how to code. Each time I struggle and then calm down I remember what I’ve been asking my students to do these many years. Encounter something new, figure out how to deal with it, maybe get frustrated, gradually understand and use the information, and then encounter and explore something else that’s new. Well maybe it’s not 21st Century learning after all — just learning. Stay tuned for more Scratch reports!